As I was perusing the massive Hershey booth at the All Candy Expo, I was surprised to see what appeared to be bags of soft licorice among the typical Hershey offerings, mostly of the chocolate variety. Much to my chagrin, however, everything was under lock and key and I had no idea what exactly these new licorice confections might be. When we finally met with the Hershey representative, she explained that they were launching a new line of soft eating licorice. Naturally, I immediately asked for samples but was disappointed to learn that they didn’t have any available at the show. I was promised a shipment as soon as they were available and went home hoping that day would come quickly. Needless to say, I was overjoyed to receive a box containing a very nice box and a package of each flavor: black licorice, strawberry, and peach mango. Naturally, being a black licorice fan, I opted to try that one first. As I started to rip open the bag, I noticed something that both shocked and surprised me… resealable bags! Oh my god! No more folding over the tops of opened bags only to pick them up the wrong way and have the contents dump all over the ground. No more stuffing myself to finish a bag just so they won’t get stale. It’s a revolutionary breakthrough! Ok, so it’s actually just the candy industry catching up to the pet food industry (do dogs really need to have zipper protected kibble? ), but it was a beautiful thing nonetheless. Anyway, on to the tasting…. Black Licorice: At first blush, this was much chewier than I expected. The pieces are small and easily bite-size, which is nice, but the chewiness borders on gummi. That’s not necessarily a bad thing, but it’s very different than the texture of my favorite licorice, RJ’s Soft Eating Licorice; I guess I expected something similar because the bag is similar. After I got past that surprise, I managed to focus on the taste – it’s good! It’s a very mild black licorice flavor, but it’s very sweet as well. It doesn’t scream licorice! at you, but you can still taste the flavor in there. Peach Mango: This one really surprised me. First of all, the smell hits you as soon as you open the bag – very peachy, almost like the smell of a jar of peach baby food. The flavor, however, isn’t nearly as strong as the smell. It’s definitely fruity with peach overtones, and perhaps a touch of mango, but it’s not strong at all. In fact, it’s so mild you might find yourself polishing off an entire bag in one sitting – so much for those resealable bags! In terms of texture, this isn’t as chewy as the black; if the bags weren’t of the same design you might wonder if they were from the same line of candy. Strawberry: This one is very chewy, perhaps even more so than the black. The flavor is somewhat artificial, but while it isn’t the “red” flavor of Twizzlers and other red licorices, it still doesn’t scream strawberry to me. I think I would probably like it more if I didn’t have to work so hard for it – were these of a similar softness to the peach mango, they’d be a lot more desirable. All in all, I have to say that I’ll definitely be looking for these in stores (they should be available beginning in July) – though I’ll probably forgo the strawberry. Wow, actually here in Washington state these have been on the shelves for quite a few weeks now. I have tried the black licorice (very tasty, but as a lover of black licorice, the only thing that could make it better would have been a stronger flavor to accompany the ‘made with real licorice’ statement on the bag) and the strawberry. 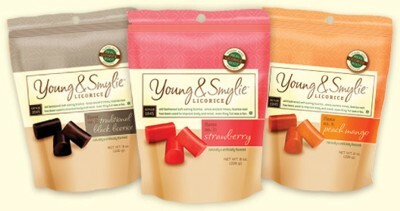 I unfortunately was really disappointed by the strawberry considering my love for the black licorice. I thought it was awful. It left this horrid, chemical-ly aftertaste in my mouth, almost like strawberry air freshener might taste, if you were so inclined to spray some in your mouth. My family downed the bag of black (ok, the THREE bags of black we bought), but we ended up throwing away 3/4ths of the bag of strawberry. All in all, it seems the candy varies from flavor to flavor quite a bit, quality wise. I only hope the peach-mango is more along the lines of the black than the strawberry. I saw these this week, at K-Mart of all places! I will have to go back and try them now. Thanks for t he review. I got the peach mango and I couldn’t put them down! I love them so much. I bought some while out shopping Labor Day weekend, although I am not a huge licorice fan, my boyfriend and I at the entire bag in two days!! — They are so delicious, soft and yummy. Right now I’m online trying to purchase them in bulk! Bought a bag of black today at Target without realizing they were made by Hershey. I agree that it’s a bit too chewy and almost sticks to my teeth, and in my opinion it’s a bit too sweet. But not bad. Oh, and the resealable dog food bags? I suspect that’s to keep critters out rather than freshness in.